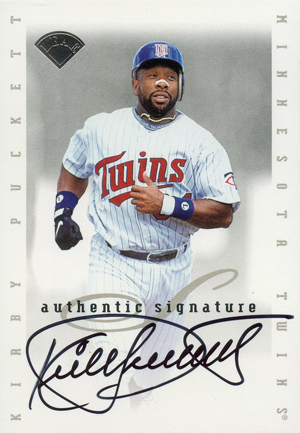 1996 Leaf Signature Series Baseball is an autograph collector's dream. The first set to offer an autograph in every pack, the checklist includes many of the era's top stars, several of whom haven't signed many cards over the years. 1996 Leaf Signature Series Baseball was released in two waves. The base cards are the same in each but the autographs came with different designs. The 150-card base set is often overlooked. 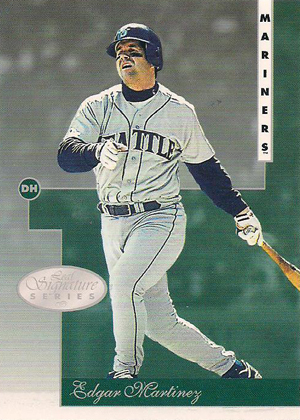 The cards don't really stand out and the only rookie card in the set is Darin Erstad. The first 100 cards came with the first series. The final 50 base cards came in Extended Series packs. For most, this set is all about the autographs. Each pack of 1996 Leaf Signature Series Baseball comes with at least one autograph. One pack in every four first series boxes has only autographs. More than 250 players signed for Series 1. These cards have a medallion in the middle part of the card that is either bronze, silver or gold. For non-short prints, players have 3,500 Bronze Autographs, 1,000 Silver and 500 Gold. Ten short prints have 700 Bronze, 200 Silver and 100 Gold Autographs. Extended Series Autographs do not have the medallions. Most players signed another 5,000 cards, although there are several short prints. There are also 31 Extended Series Century Marks Autographs parallels. These were the first 100 cards signed by each player. They are noted with holographic foil at the top of the card. Although they have the Series 1 autograph design, Jim Thome, Carlos Delgado, Brian Hunter, Phil Platier, Terrell Wade and Ernie Young are in Extended Series packs. Also, Thome does not have any Bronze Autographs. Extended Series Autographs of Alex Rodriguez, Andruw Jones and Juan Gonzalez were redemptions, which have long since expired. What helps 1996 Leaf Signature Series Baseball remain popular after all these years is the stellar autograph checklist. It had dozens of stars who have left a lasting impression on the hobby. 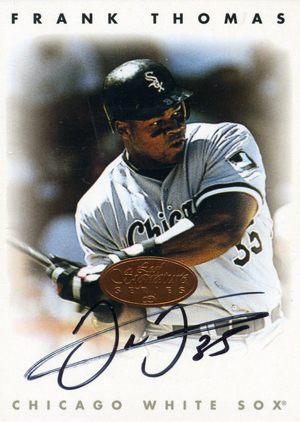 These include Frank Thomas, Derek Jeter, Alex Rodriguez, Greg Maddux, Roger Clemens and Sammy Sosa. Collectors can also find autographs from players who don't sign very often, like Mariano Rivera and Jim Thome. A pair of Frank Thomas dealer promo cards were made to advertise the set. The more common version has a facsimile signature. However, there are also 500 promos that have an authentic autograph. Promos are very easy to spot as they have "Promotional Card" written on the front and back of the card. 150 cards. Series 1 has 100 cards. Extended Series is 50 cards. PARALLEL CARDS: Gold Press Proofs 1:12 Series 1 Packs and 1:8 Extended Series packs, Platinum Press Proofs 1:24 Extended Series packs (Print Run: 150 cards). 252 cards. Common autographs have a bronze medallion on the front. Short prints are noted with SP. 217 cards. Short prints noted with SP and print run if available. Each card as a print run of 100 and are noted by the holographic foil at the top of the card. This is a partial parallel set. 1996 Leaf Signature Series Autograph Marty Cordova Gold Silver Bronze Set L@@K! !